The Heights Observer welcomes all who want to participate in submitting community news and information. We ask that all Members (those who submit stories and photos) abide by the following terms and conditions. Please submit original stories/photos. When you do use others' sources of information please attribute that information by including a link, the source, the author, etc. If you need help with this contact us at info@futureheights.org or 216.320.1423. Being succint is a courtesy to readers and is the best way to minimize the changes made during the editing process. Direct your readers to articles with a link instead of copying and pasting the entire article. Copyrighted material cannot be published at the Heights Observer without express permission of the copyright holder. If you want to tell others about an article found elsewhere on the web, please provide a link to that article. By posting or contributing content using these Services, you are granting the Heights Observer a non-exclusive, royalty-free, perpetual, and worldwide license to use your content in connection with the operation of the Services, including, without limitation, the license rights to copy, distribute, transmit, publicly display, publicly perform, reproduce, edit, translate and reformat your content, and or to incorporate it into a collective work. The use of full first and last names for all submissions will, we hope, preclude us from having to police uncivil behavior. You own your posts and words. Please treat your fellow community members with respect and civility. Refrain from posting abusive, obscene, vulgar, slanderous, hateful, threatening, sexually-orientated or any other material that may violate any laws or conduct constituting on-site or offline harassment of other users of the Heights Observer. We do, however, encourage robust discussion! If you have a problem with the website or with any particular post, please contact us at info@futureheights.org or 216.320.1423. 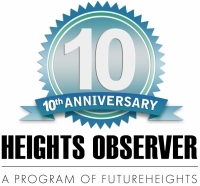 Registering as a user on heightsobserver.org, as a Member or registering on the Heights Observatory forum constitutes acceptance of these policies and agreement to abide by these terms and conditions. The Heights Observer is not responsible for stories and comments posted on this site. 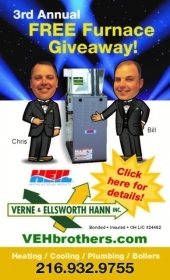 Information posted on the site is the responsibility of the individual posters and not the Heights Observer. The Heights Observer reserves the right, though not the obligation, to refuse publication of any story or comment, and to delete any content posted through it at any time and for any reason. 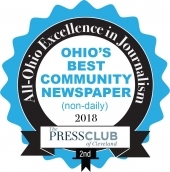 The Heights Observer reserves the right to ban or suspend any user at any time, with or without warning, for activities that put the site at risk.